Last winter’s relentless rain wrecked our home’s roof, so today we had a roofer out to take a look. Sadly, he confirmed that our roof cannot be fixed and must be replaced. 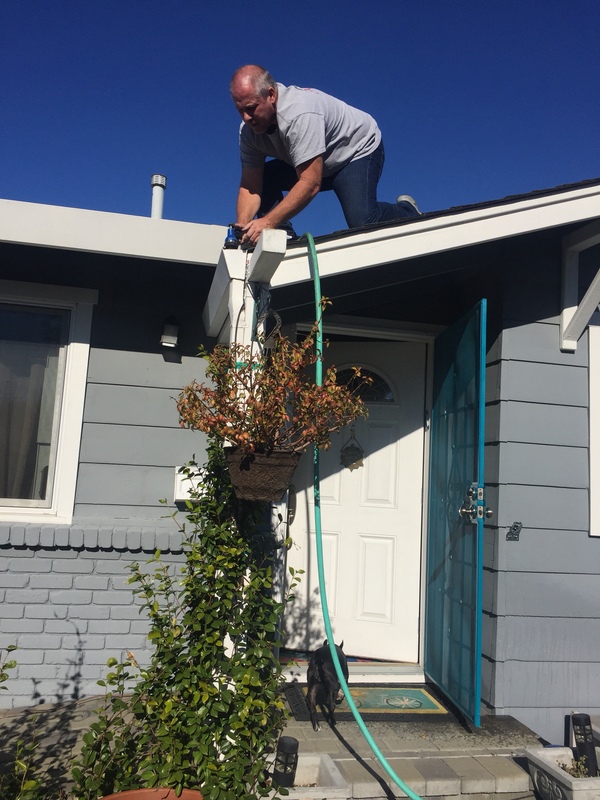 After gently delivering the bad news, he was very kind to tell us about a gutter problem he discovered and then help us fix it. We’d already cleaned out the gutters for winter, but we weren’t aware that the downspout by our front door was clogged. Our lovely, fragrant star jasmine plant that wraps around the post/downspout had grown back down inside the piping! This sweet man, here just to measure our roof, went back up there and yanked out a 10-foot-long, 1/4-inch thick, rope-like branch of jasmine. Then he asked me for the hose so he could flush it clean! I was so grateful, I could have kissed him! Day 340 of 365. And Day 706 in a row! We need to set up on of those fund-source (or whatever they’re called) sites to pay for that roof! Oh Yvonne, that’s the sweetest, most amazingly kind suggestion ever! I’ve been procrastinating dealing with the roof because I have no idea how we’ll pay for it. Could one of your local friends get that organised? Let me know if it happens. Crowd-funding, it’s called (here in the UK). Here’s a thought: if your house had burned down in the fires a few weeks ago you wouldn’t have to worry about the roof, it would have been covered by your insurance, along with everything else. That is meant to help you look on the bright side, you know, you have a new roof to build, but at least you have a house to build it on. It’s been on the news that there are more fires in California, and the winds are too strong for the water-dumping planes to fly. Yes, it’s a sad thought and it did feel a bit ironic as I was hosing down our dilapidated roof in hopes of saving our home during the massive firestorm. There are so many people in our town rebuilding from nothing. I am grateful we have a home, even if it needs a new roof.